I tend to create many filters in Gmail so that lots of types of email I receive daily doesn't interrupt me with new mail notifications, but instead gets assigned a certain label (kind of like how Gmail tried to do automatically, but I would like to have explicit control). My typical workflow is that I open the email, select the option "Filter message like this one" and leave the auto populated items here (typically sender address or a mailing list name). Then on the next screen, I always select the same options (skip the inbox, apply label [label name is typically one of 2 I mostly use], and also apply to selected messages). 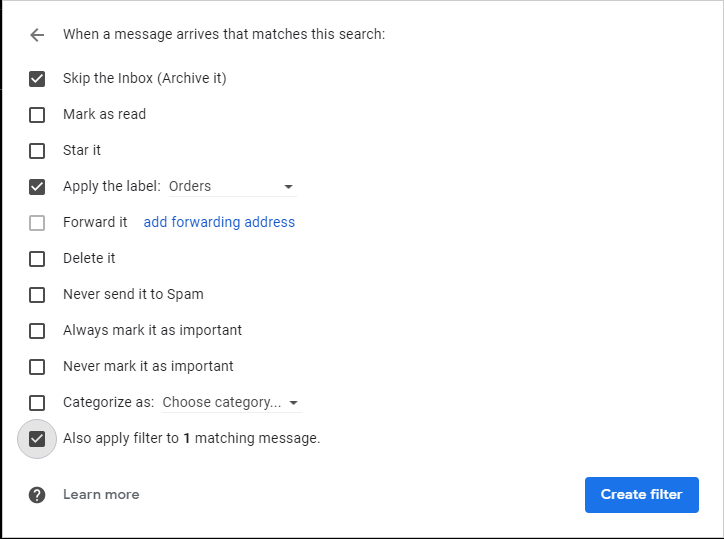 Is there a way to either batch create filter like these (i. e. select a bunch of email by some means, and apply this filter to any that match these senders), or to have some sort of filter template instead of having to check all those boxes each time? Calculate the size of label/search/filter?